Mx the first five ingredients well, then add chopped peanuts. Taking rounded tablespoons of dough, roll into balls. Roll balls in sugar or just sprinkle on top. Flatten slightly with the bottom of a glass. Bake on parchment paper, in a 350 degree oven, for about 15 minutes. IMPORTANT: allow these to cool a few minutes before you remove them to wire racks to cool completely. 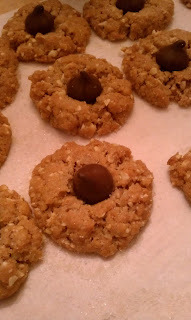 If desired, press a Hershey's kiss, (or a dark chocolate drop) into the cookie IMMEDIATELY after removing from oven! melt butter in saucepan, sautee onion until soft. Add spinach, artichoke hearts, cream cheese, 1 1/2 cup shredded cheese, tabasco. Stir until blended and heated through. Pour into casserole dish, sprinkle w/ remaining shredded cheese. Bake at 350 about 10 minutes until cheese starts to brown. Preheat oven to 375° F. Sift cornstarch, sugar and salt together, mix the egg and blend in the butter. Knead well. Let stand ten to fifteen minutes. Shape into balls in the palm of your hand and drop them onto a parchment lined cookie sheet. Bake for approximately 12 minutes. Be very gentle with them when you remove to a cooling rack - the lack of gluten seems to make them prone to crumbling. Ever wondered if you could slow roast a pork loin, say while you were gone to church Sunday Morning? I did and couldn't find a good answer, so I tried it on a day I was home to watch the oven thermometer. Result: at 225 it works well. It turned out very well for my newest offspring's baptism lunch. I browned the top (fatty side) of the ten pound loin ( cut in two pieces to fit in my pan) over high heat on the stove. Turn off the heat, flip the pork (so fat side is now up, which will make it all juicy! ), season*, then place in a cold oven and turn oven to 225. From this point anywhere from 3-4 hours would have been on that sweet spot of a medium pork roast (144 at 3 hours, 150 at 4).